CLICK ON IMAGE to see George Anderson’s Yellowstone Anglers’ 2018 8-Weight Shootout Results. Image credit Yellowstone Anglers. You can’t tell if a rookie QB is going to be Tom Brady by how fast he runs the 40, how high he can jump, how many times he can throw a football through a hanging tire at 50 yards, or how much he can bench press. Game on, fast forward through to a 14 win season that lands in the Super Bowl – different story. Yeah, you can tell now. And so it is, or so it seems with some rod review protesters. 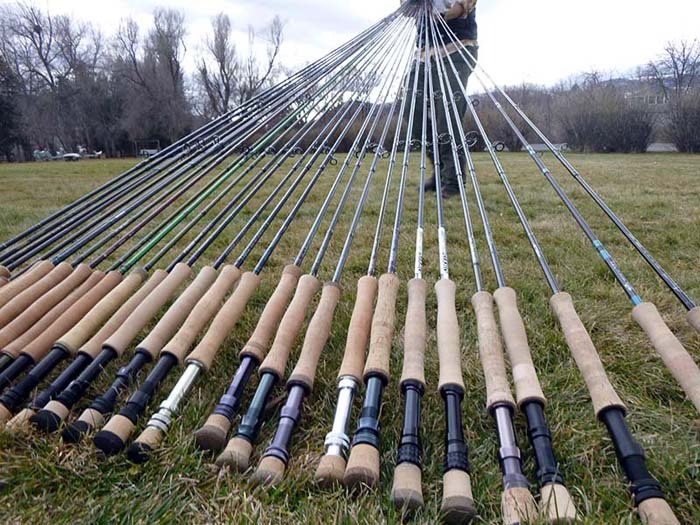 They declare all fly rod reviews not done on luxury trips around the globe, catching hardly ever heard of exotics like trout and bonefish are fundamental prerequisites for adequately evaluating fly rods. So, are they saying George and James Anderson’s annual 5- and 8-weight Yellowstone Angler Shootout are BS? Also, that these touring protesters are force-fed gourmet lodge meals, suffer paid for airfare and free everything clothes and gear that sometimes doesn’t fit just right on a Saturday night worth combat pay? So, after a year of that and being STD free, only these protesters can provide an accurate review of anything, including a fly rod? Maybe it’s the flowery phraseology that we all are beginning to rebel from? Fly rod company wordsmiths call their products accurate, light in-hand, balanced, forgiving, and other such descriptions which an inanimate object couldn’t possibly be praised for or found guilty of. A sniper is accurate or not accurate; his or her weapon is neither. A balanced fly rod? What could that possibly be? Sure, add a reel and keep moving your index finger around until it balances. Oops, you forgot to add backing and fly line to that empty reel. Light in hand – god only knows what that means – compared to what? An anvil? Forgiving? Like the cop, you told to go f*#@ himself forgave you? A fly rod can’t forgive because you cast into the trees, broke it at a ferrule because you didn’t seat one of the sections firmly. A fly rod can’t forgive because you can’t cast worth diddle. Will that fly rod you wiggled in the fly shop feel as good when it’s game-on? Will that fly rod you paid $800 for – lined with an $80 fly line and lawn cast 100-feet on a no wind day be just as cool when it’s game on in the Baja? When a rooster hangs in the balance on rocking boat deck with the wind huffing at 15 knots, and you need to reach it at 75-feet – can you make it happen? Guides will tell you no; a certain fly rod may not perform when it’s game on. But what they mean is, that the action on a particular rod may struggle in the wind more than another, the fly rod may not handle heavy, weighted flies as well as another fly rod. More importantly, how well can YOU play when its game on is what they might mean. The lawn campaign is the best indicator that you’re going to get what you paid for. With the luxury of a few differently lined reels (a good fly shop will have several lined demo reels). A couple of different rods you haven’t yet ruled out and a few minutes with each – plus a few more go-rounds and in a half hour or less you’ll be able to choose the best of the litter, easily. If you’re new to fly fishing, relying on a fly shop guy or gal is almost always a safe bet. Yes, they’re selling what they have, but underlying is that they want… you as a customer – forever.